Most if not all modern laptops or tablets comes with a wireless adapter and that allows you to conveniently connect to the Internet without cables. The wireless network that appears in your list means that the wireless router is near you and you can only connect to it if you know the wireless password as most of the wireless networks are password protected. You won’t be able to pinpoint the exact location of the wireless router but can only guess when you see the signal gets stronger as you move around. Obviously there is no way you can contact the owner of the wireless network as it does not reveal any information other than the SSID. However Wifis.org has made it possible for people nearby to contact the owner of the Wi-Fi network by a few simple steps. 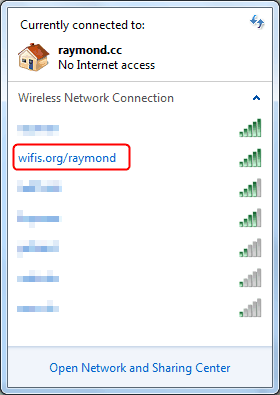 Basically you need to create an account in Wifis.org either by logging in to your Google or Facebook account and then register a unique URL such as http://wifis.org/raymond.cc. Once the URL is created, opening the link in a web browser will present a contact form for the visitor to send a message to the owner’s email. Up till now, there seems to be nothing special about it other than a contact form. In order for people to know the contact form URL, the trick is to change the name (SSID) of your Wi-Fi network so that people within the Wi-Fi range has the opportunity to contact you without them knowing who you are and where you live. The image below shows the Wifis.org URL in the Windows SSID list. 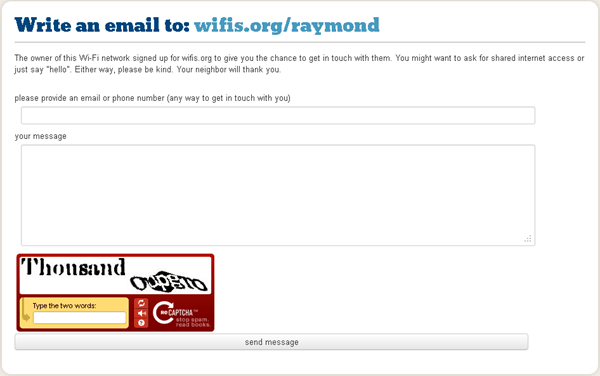 Anyone within your Wi-Fi range can send an email to you via the Wifis.org contact form. This idea seems to be unique but has some drawbacks. First of all your neighbor that wants to contact you must have their own Internet connection or else they won’t be able to open the contact form at wifis.org. Secondly, the email doesn’t contain the IP address of the sender in the email body and headers. Thirdly, not everyone will automatically know that the URL in SSID can be used to contact the owner unless they are curious and decided to visit the link. Nevertheless, Wifis.org service is free and you can still use it as a contact form for your website.